Condition is Pre-owned. Sorry no box, but I will provide a dust bag. Manolo Blahnik Mule Dress Shoes Size EUR 35 / US 5. The shoes are material-based. Not shiny, but matte. Nice rubber on the soles so as to not slip. Black shoes are the hardest to capture on film! MANOLO BLAHNIK Black Patent Tie Slingback Heels Size 36.5, 6.5, Beautiful! MANOLO BLAHNIK Black Patent Tie Slingback Heels Size 36.5, 6.5, Beautiful!. Condition is Pre-owned. Heels only worn a couple of times. They are in great shape! There are two places on the left shoe where the foot lining is slightly peeling back. It’s an easy fix for a cobbler. However, it does not affect the wear or look at all. The ties can be worn tied around the ankle or as a bow. They are such a classy and timeless pair of heels. Shipped with USPS Priority Mail. The inside of the shoes are beautiful gold with a plastic turquoise stone starburst at the toe. Manolo Blahnik Size 37 Green Strappy Open Toe Leather Sandals. Condition is Pre-owned. Shipped with USPS Priority Mail. Normal wear, light scuffs ad sole wear. Beautiful fresh green color. MANOLO BLAHNIK Peep Toe D'orsay Pump Beige Suede Leather. These shoes are in great pre-owned condition. Photos have been added for your review. Heel Height: 2-7/8" Approx. Toe: open toe Style of Shoe: D'orsay Pumps Print or Graphic(s): n/a Embellishment(s): n/a Hardware: n/a Additional Information: n/a Size: 40/American 10 Color: black Fabric: patent leather Heel: silver leather Measurements Insole: 10-1/2" Width Across Toe Box: 3-1/2" Heel: 4" Platform in front: n/a Condition: Pre- owned- good condition. Wear to soles/silver insoles; White color transfer on side of right shoe; Pink color transfers on both heels (see pictures) Box: no Dustbags: no. MANOLO BLAHNIK. Wrap around leather tie fastener at ankle. Ladie's Clothes. Leather upper, lining, and soles. The Emperors Old Clothes. White bow on vamp. Gently worn very good; minimal scuffing on uppers, heels & soles from wear. So put us in your favorites. Bottom from under 3-1/3" heel to toe - 8-1/4" width across ball - 3". Inside sole from open back to tip of toe - 10" appx. Size: 39 (SPECIAL EU). 38, 38.5 5, 5.5 8, 8.5 38.5, 39 25.5, 26 9.375"-9.5". 39, 39.5 6, 6.5 9, 9.5 39.5, 40 26.5, 27 9.6875"-9.875". 12 45 11 12". 11 44 10 11.5". 10.5 43.5 9.5. 10 43 9 11.5". 9.5 42.5 8.5. DE SCRIPTION - Manolo Blahnik heels are truly iconic. - Brown leather strap that goes around the ankle twice with a gold buckle. - Suede front with Raised lines. FAIR CONDITION – SALVAGEABLE WITH REPAIR, BUT THE STRUCTURE AND BONES OF ITEM ARE GOOD. Condition: Pre-owned. Slight Interior Residue. Light wear marks along suede. Light rub marks along suede. Wear on sole. Residue on sole. Slight Exterior wear. Fabric Content: Leather, Suede. New, unworn Manolo Blahnik classic heels in rich chocolate brown suede. Peep toe, size 40. These Manolo Blahnik Leather Suede Cut Out Peep Toe Pump High Heels are a fun twist on a classic! Features soft suede with cut out scallop and flower designs, peep toe, and slim heel. Size 39 (us 9). Designer: Manolo Blahnik. Style: Pointed Toe Slingback High Heels. Heel Height: 3. Material: Leather. Insole: 10. Original Manolo Blahnik box is included. Color: Beige. 100% Authentic. Size: 39.5 (Approx US size 8.5). Smooth leather pointed toe with elastic slingback and decorative swoop detail. 3" high leather covered architectural leather covered heel. Leather sole and insole These are from the designer's higher end line. MANOLO BLAHNIK. Designer : MANOLO BLAHNIK. Size Stamped on Shoe : 40. Heel Height : 4". Content : Leather. Color : Gold. Condition : Excellent, light wear. US Size : 10. Beautiful slingback Monolo’s... never been used. Perfect conditions. • Color: Black. • Size: 39/9. just ask! Pre-owned Very Good Condition. Condition (see photos for details). GORGEOUS WHITE EYELET fabric with a FLORAL pattern. CONDITION: NEW with minor defect INSIDE the shoe. This is a manufacturer's defect (just how the shoe was made). SEE LAST 2 PICS. GREAT FROM OUTSIDE! Excellent condition, very clean. Size 6 1/2. Size: 39.5/American 9.5 Color: black Fabric: suede Toe: open toe Style of Shoe: sandals w/ ankle strap Print or Graphic(s): n/a Embellishment(s): ruched strap Hardware: black suede covered adjustable ankle buckle Additional Information: n/a Heel: black suede Measurements Insole: 10-1/4" Width Across Toe Box: 3-1/4" Heel: 3-3/4" Platform in front: n/a Condition: pre-owned- good condition. Soles have been resoled; Toe imprints on insoles; Creasing to straps (see pictures) Box: no Dustbag: no. 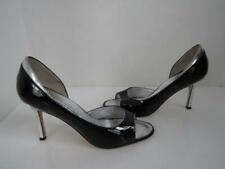 MANOLO BLAHNIK Size 39 Black Patent Leather Slingback Heel Sandals Great condition, see pictures for more details! No return accepted! Thanks for looking! Condition is Pre-owned. No flaws to report. I do not have an original box. No defects on the heels. Soft leather and zebra fur soles. MANOLO BLAHNIK. Designer : MANOLO BLAHNIK. Content : Suede. Size Stamped on Shoe : 40. Heel Height : 4". Color : Red. Condition : Excellent, light wear. US Size : 10. MANOLO BLAHNIK. Designer : MANOLO BLAHNIK. Content : Suede. Size Stamped on Shoe : 40. Heel Height : 4". Color : Brown. Condition : Excellent, light wear. US Size : 10. Toe: pointy toe Style of Shoe: slingbacks Print or Graphic(s): n/a Embellishment(s): shell embellishments on strap Hardware: Brushed gold adjustable ankle buckle Additional Information: n/a Size: 40/American 10 Color: black/olive Fabric: linen Heel: olive leather Measurements Insole: 11-1/2" Width Across Toe Box: 3-1/4" Heel: 4" Platform in front: n/a Condition: Pre-owned- good condition. Soles have been resoled; Scuffs to heels Box: no Dustbags: no. Manolo Blahnik black patent leather heels. modern & iconic fashion. Heel- 3 1/2". Show normal signs of wear, in very good condition. Insole Length- 9". are preowned and may have been altered. It is your. Patent leather pump heel. Insole Length: approx 9.8” (all the way from pointed toe). Condition: New. (refer to the last two photos for details). covered heel. Size: 38 (US 7). Soles and insoles have minor scuffs from being tried on and the ankle strap buckles on both sandals are missing. EU Size: 40. Platform: N/A. Material: Leather. We carry all the big designers! Check out our ever-changing scene of the hottest new styles! MANOLO BLAHNIK Snakeskin Heel Sandal. 40 1/2 EUR. Slingback w/elastic strip for comfort. Color: Black. Condition: These sandals are pre-owned and to show wear on the heels and soles. But they are still in good condition. Size EUR 40-1/2. Material Suede, leather sole. Top Excellent condition. Bottoms Excellent condition. Heels Excellent condition. As you can see from the pics, there is very little wear above the sole. Excellent condition with only sign of wear on sole after being worn twice. MANOLO BLAHNIK. Mary Jane Style. Brown Leather Uppers. Brown Leather Insoles and Lining. Natural Leather Soles. Expedited or overnight service is available when requested. MANOLO BLAHNIK. Designer: MANOLO BLAHNIK. Size Stamped on Shoe : 40. Heel Height : 4". Content : Leather. Color: Black. US Size : 10. Item #: 74-7540-1hpd-to-071816. Pointed toe. - Satin ankle bow tie. - Suede covered heel. - Black suede upper. scoring a spectacular deal on a pre-owned gem or. - Heel Height, 3.5". - Leather insole and sole. (that no one else can find). Normal insole and outsole wear. No box or duster or any other accessories. Manolo Blahnik. -Leather soles. -Color: Black. -Lightly scuffed on the back heel. Not noticeable unless seen from up close. Color : Pink. Fabric Content: Patent Leather. Want more?. 38, 38.5 5, 5.5 8, 8.5 38.5, 39 25.5, 26 9.375"-9.5". 39, 39.5 6, 6.5 9, 9.5 39.5, 40 26.5, 27 9.6875"-9.875". 12 45 11 12". 11 44 10 11.5". MANOLO BLAHNIK. Designer : MANOLO BLAHNIK. Content : Suede. Size Stamped on Shoe : 40. Heel Height : 4". Color : Burgundy. Condition : Excellent, light wear. US Size : 10.